The northwest Vietnam retains an air of adventure with rugged natural beauty and untouched culture. 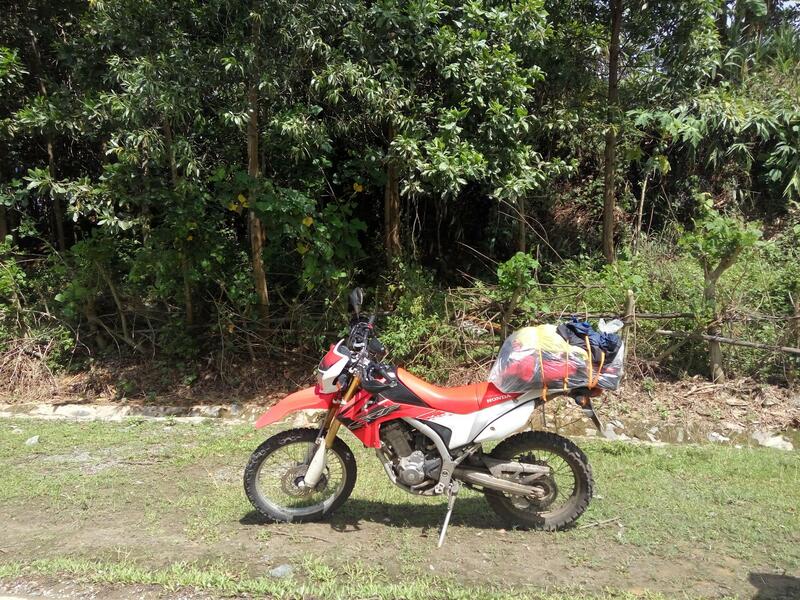 If you have time in Vietnam and still wondering what to do, make your Vietnam motorbike trip more worthwhile with this journey. 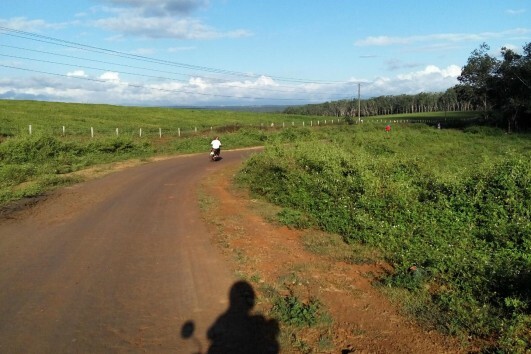 The motorbike tour gives you the true sight of minorities’s culture, ethnic costumes, jewelery, ethnic musical instruments, culture and art publications are on display. 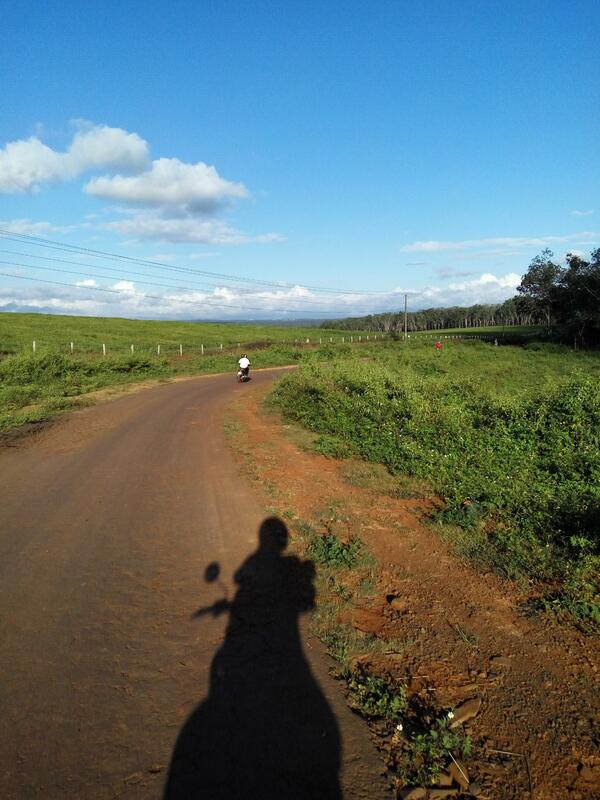 Take a break anytime you need, and enjoy riding to the untouched, we appreciate every moment you spend with us. Mai Châu is a mountainous region located in Hòa Bình Province, approximately 135 km from Hanoi and 65 km from Hòa Bình town. This idyllic valley is embraced by emerald mountains and clouds, making it an retreat centre in North Vietnam. The verdant mountainous scenery and tribal culture of Mai Châu attracts many visitors every year. There is an estimated 48,570 inhabitants including 7 Ethnic Minority groups. ‘White Thai’, ‘H’Mong’, ’Zao’, ’Muong’, ’Tay’, ’Hoa’, and ‘Viet’. 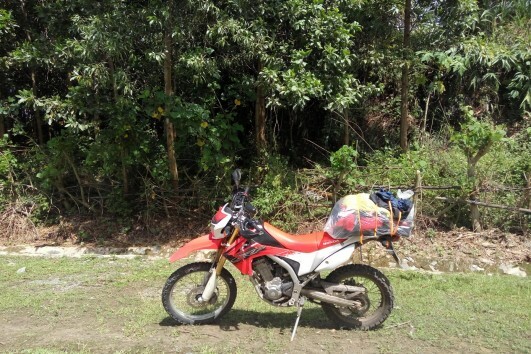 Mai Chau consists mainly of the ‘White Thai’ people. The Ban Lac People have Thai ancestors that settled in the North-Western area of Vietnam. The two tribes, White Thai and Black Thai, settled in the same area and make up the largest ethnic population of the region. The Mai Châu area is well known for its stilt houses. The type of stilt houses, or pile dwellings, they construct are called Thai stilt houses and are made of bamboo and timber. These houses are elevated 10–12 feet off the ground in order to avoid water damage and shelter animals from the elements. The Black River (from the Vietnamese name sông Đà, from đà “dark-brown). Its source is in Yunnan province of China. From China, the river’s course passes through the Vietnamese provinces of Lai Châu (where it forms part of the border with Điện Biên Province), Sơn La and Hòa Bình. The Black River is the most important tributary of the Red River, which it joins in Tam Nông District near Việt Trì inPhú Thọ Province. The next roads lead you to MuCang Chai, its charms that are hidden in the scenic rice fields and thin blankets of fog at the beginning of the winter. 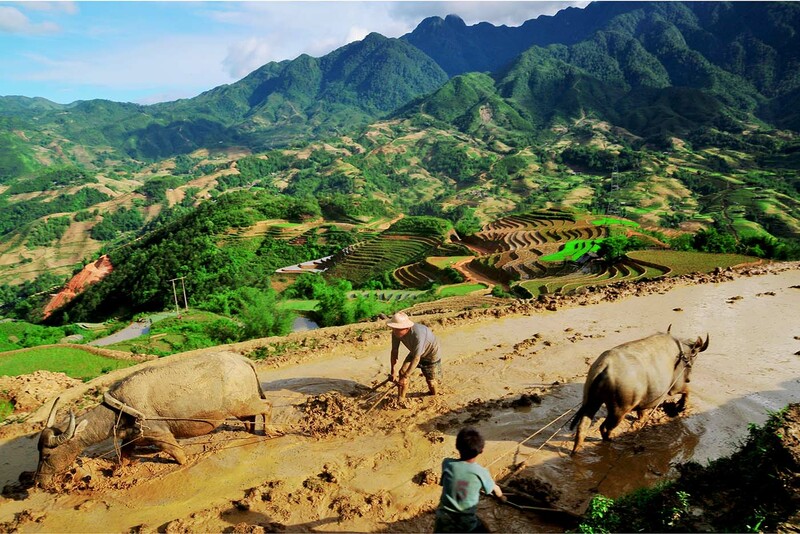 The popular attraction of Mu Cang Chai lies in its terraced rice fields which are primarily situated in the district’s Che Cu Nha, La Pan Tan and De ZuPhinh villages. These imposing fields draw a large number of both Vietnamese and foreign travelers who love to take pictures of and indulge themselves in the amazing beauty of the national heritage site. For the place being about 1000 meters above sea level, the steep hills make it almost impossible to grow rice fields like those in the delta. Thus local residences grow their own rice on the terraced fields, for the purpose of preventing water from flowing downhill. These terraced fields lying among rugged green moutain valleys, under clear blue sky or a mysterious and crips fog, bring to eyes an imposing scenery. During harvesting season, ready crops transitioned to yellow, while new crops still remain in their green color. The scenery is a big attraction to photographer and trekkers. 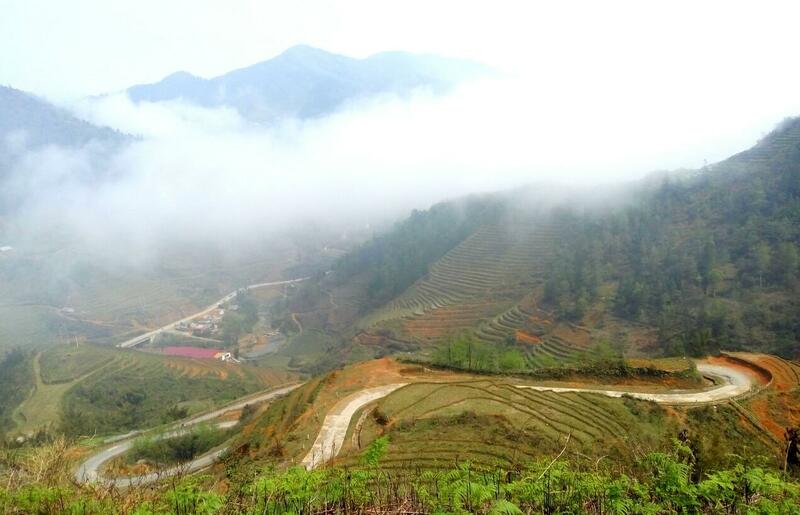 Well, the fancyful fogged town brings in peace in a fine, rugged scenery and cultural diversity…Geographically, Sapa is exactly a mountainous area of Northwest Vietnam. 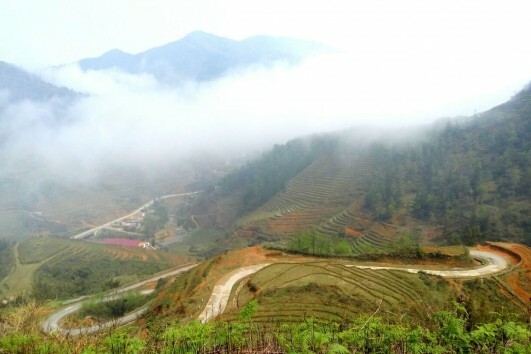 The whole Sapa District is dominated by the Hoang Lien Son mountain range which is at the Eastern extremity of the Himalayas, being famous with the Vietnam’s highest mountain of Fansipan at a height of 3,142 m above sea level. The town of Sa Pa lies at an altitude of about 1,600 m, bringing in a cool and foggy site of Sa Pa.
Sapa is famous for its special cultural diversity in a combination of ethnic minority groups’ culture. Visitors to Sapa will have opportunities to discover the unique customs of the local residents. Local markets are the town’s typically cultural element, which are always crowded and joyful, attracting hundreds of visitors. This is the common place for minority groups to gather and exchange goods. What is more, tourists coming to Sapa at weekends have the great chance to learn about local ethnic people’s courtship and martial life, through the Sapa love market and wife kidnapping ceremony of the H’Mong group. Being a minority ethnic people market, the town of Bac Ha is famous for its Sunday market which is a trading center and meeting place for couples, friends, and relatives every Sunday. Every Sunday, Bac Ha hosts the biggest fair near the mountainous highlands and the Chinese border. It is the largest and most colourful market in the area and attracts throngs of villagers from the surrounding hill tribes. Some walk several hours for the weekly opportunity to trade and barter food, animals, clothes and household goods. Many different ethnic groups such as Flower H’mong, Phu La, Black Dao, Tay and Nung minorities gather to buy and sell local products that cannot be found elsewhere. The market was very crowded, local products for sale or barter are carried on horseback. Besides the usual items like pigs, cows, chickens, and ducks, Bac Ha Market sold dogs. As dogs were available as cuts of meat, they were also available live, right next to the live pigs, chickens, and other livestock. There was a brisk trade at the market for everything from hand-embroidered skirts to all manner of 4-legged animals. The “fresh” meat section is not for the faint of heart and might steer more than a few visitors in the direction of strict vegetarianism. 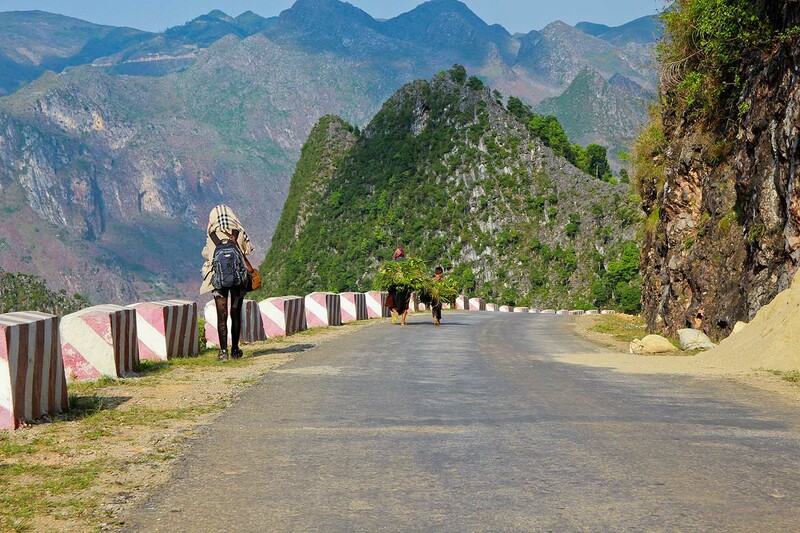 Ha Giang is a land with the natural majestic landscapes, the sharpness of long-standing living tradition of the hill tribe people that many tourists have not known. 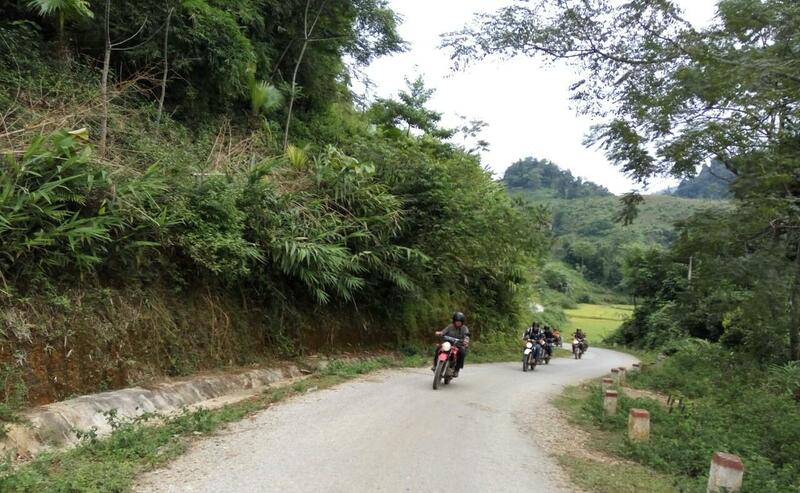 About 350km to the north of Hanoi, Ha Giang town is located in a valley four mountains be surrounded mountains and the Lo river bending in its flow. 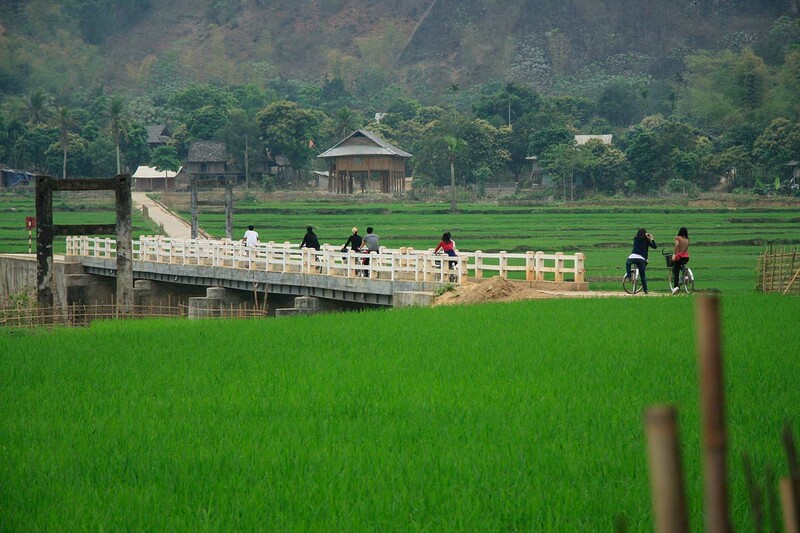 About 40 km up north is Quan Ba district, a mountainous region with cool climate year-round. Continue the journey, visitors can stop at La Sung valley, where the beauty here is difficult to be matched, the valley offers a magic appearance of rocky mountain and green forests. From Dong Van to Meo Vac one has to overcome peak Ma Pi Leng. On beautiful days Ma Pi Leng pass seems to collect all the beauty of nature, with the windy hill sides, the eyes spread to horizon. Coming to Ha Giang, everybody wants to visit Khau Vai love market, only for those who fail their love to come and see their old lovers. They come together and then again return to the family when sunset falls. 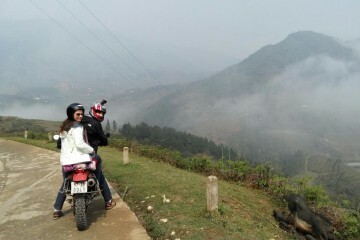 After breakfast, you will continue to join your journey to explore Meo Vac, it is 150km from the provincial capital town of Ha Giang Province. Meo Vac is inhabited by different ethnic minorities including the H’mong, the King, Tay, Dzao…Most ethnic groups have maintained their culture untouched from the outside world. 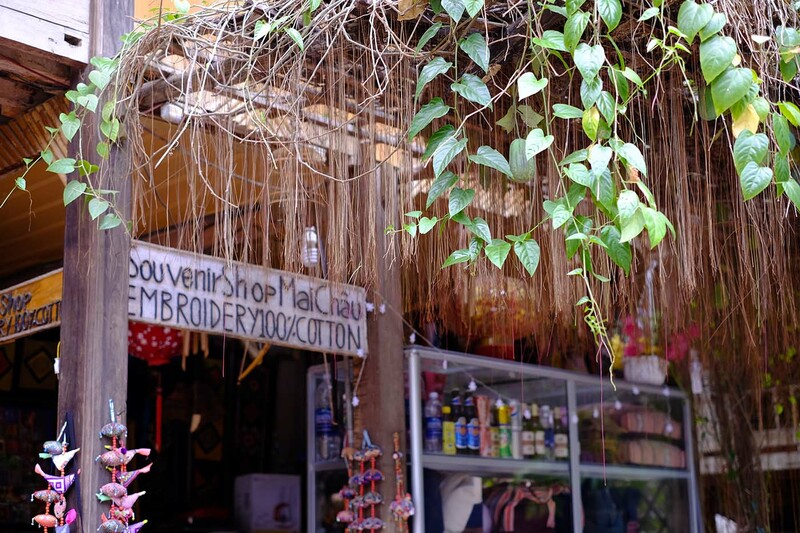 In Meo Vac, there is a love market named Khau Vai is very famous in Vietnam’s northern mountainous region, which brings you unforgetable emotions of love and local lifestyle once you take part in. 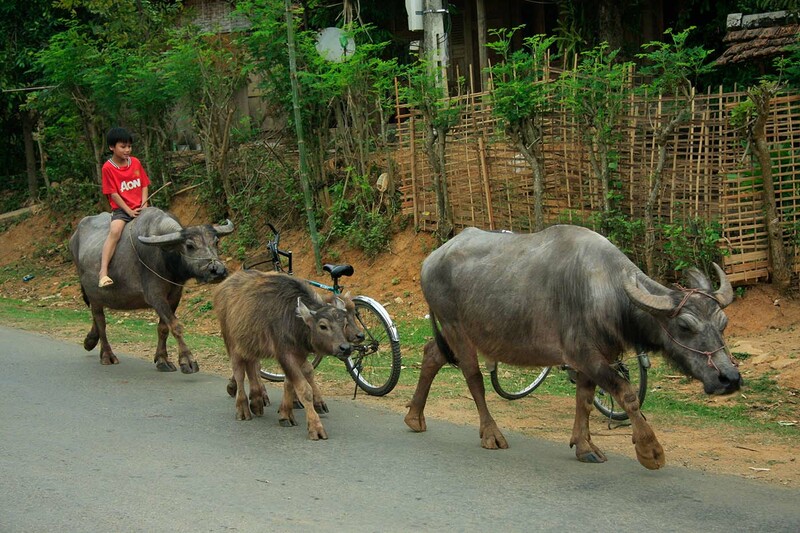 Khau Vai commune, is home to ethnic minority groups of Giay, Nung and Muong. The love market festival is held on lunar March 26th and 27th with the participation of a large number of locals. The festival features food and drink culture, song performances and folk games. And you have an overnight in Meo Vac. Ba Be national Park is a popular Vietnam’s natural complex mainly consisting of Ba Be Lake, the supposed largest natural fresh water lake in Vietnam. The 150-m altitude makes it the Vietnam’s highest lake above sea level. The reserve is in Bac Kan Province, northeast Vietnam, whose role is to protect a freshwater lake (Ba Be Lake) along with surrounding limestone and lowland evergreen forests. It is located about 240 kilometers northwest of the capital city – Hanoi.Ba Be means “Three Lakes”, however, all of them converge into a single continuous body of water. The lake is 8 kilometers long in total, about 400 meters wide, and has the deepest point of 35 meters. It is covered with many limestone mountain chains which have numerous caves and underground streams. You will feel healthy with the cool and fresh climate when coming to Ao Tien – a small lake on the top of the mountain. This lake is filled with clear water which seeps through the surrounding limestone rock. The primary for the name Ao Tien (the lake of fairy) is based on a legend that the fairies always go down in this place to swim and play chess. 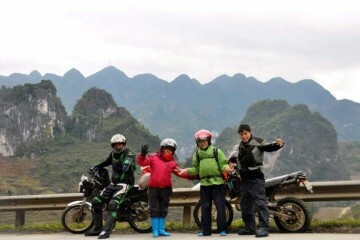 After breakfast you ride south and return to Hanoi, it is a long ride so take a short break when you need, beautiful lanscapes on the way back are just stunning and lovable. We just need to make sure to finish the tour before 4pm, so the rush hour will not bother you. List of hotels is recommended by Adventuratravel.com. Please feel free to advise hotels you prefer in each category or combine hotels category at your wish ( tour price will be changed accordingly). Note: We also provide support truck, car, bus or van to go on the tour. Feel free to tell us on your booking if you need them.